The Warwick Valley Humane Society is open 7 days a week from 12pm to 4pm. Stop by and visit us! It’s time to renew your membership with our organization and we are counting on your continued support. The animal shelter celebrates it’s 50th anniversary at it’s present location in October. Last year we renovated the exterior kennels due to their disintegration which was unsafe and unhealthy for the animals and staff. Despite additions and renovations, we have far outgrown the facility with the ever increasing population in our community. We are now in the planning stages for a new expanded facility which will offer the animals, staff and public, a more up to date shelter experience with proper ventilation, isolation rooms, and better overall housing for our shelter “guests”. The “Shelter Re-building Fund” drive is underway. 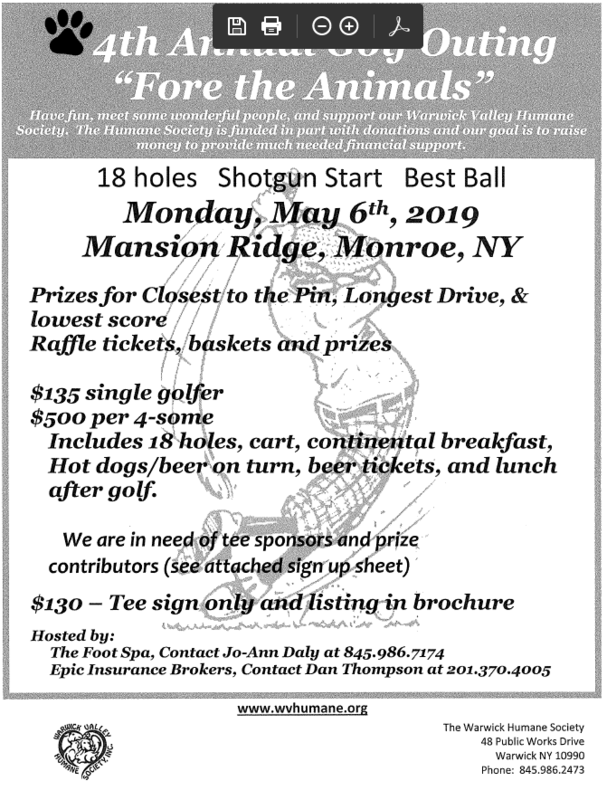 Coming up is our 3rd annual “Fore the Animals” Golf Outing scheduled for May 7th at Mansion Ridge Golf Course at 1292 Orange Turnpike, Monroe, NY. And this year we are pleased to partner with Winslow Therapeutic Riding Center for the Sunset at Winslow fabulous fundraising event scheduled for June 16, 2018 at 1433 NY-17A, Warwick. We hope you will join us as either a sponsor or guest or both! And in September our annual 5K4Paws road race. The Towns of Warwick and Chester have renewed the SNR (spay-neuter-return) low cost program for cats. Certificates are available for purchase at the Humane Society with proof of residency from either Town. A few highlights of last year include a 12 cat rescue from a hoarding situation, the rescue of a heron dangling from a tree over a pond, rescue of an injured snowy owl, saved a dog with surgery for an ingested safety pin, a dog with a broken neck, and a 15 year old senior severely matted dog tied to a tree in freezing temperatures. 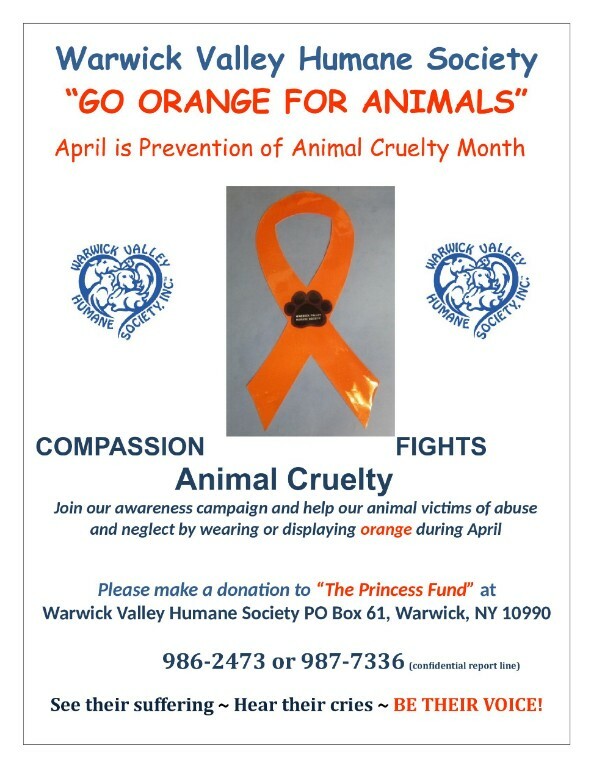 April is Prevention of Animal Cruelty Month and we GO ORANGE for animals by wearing and displaying orange ribbons. Please join us in our effort to raise awareness and be our eyes and ears in your neighborhood. Report any suspected neglect or abuse to our confidential line at 845-987-7336. Nominations are now being accepted for the June election of Officers and Directors of our Society. Members in good standing are eligible to vote. Nominations may be made by members delivering written notice to the Recording Secretary (Jeanine Nostrame) not less than two weeks prior to the election meeting of tentatively June 10, 2018. On behalf of our efforts and labors of love for our homeless pets, thank you for being a member! Visit our website at www.wvhumane.org for our upcoming events and adoptable pets and we extend to you an open invitation to visit us at the shelter Monday through Sunday from 12noon until 4pm. Help us build a new shelter, please donate today! © Copyright Warwick Valley Humane Society 2019. All Rights Reserved.